The Snowy Season Luxury Topper Collection will delight you with beautiful snowy scenes perfect for those who dream of a white Christmas. The imagery features picturesque landscapes such as woodlands and gardens with a dazzling dusting of snow. The gorgeous frosty blue and snowy white colour palette really brings the snowy theme to life and the stunning silver accent foiling defines the toppers gives them a sensational edge. 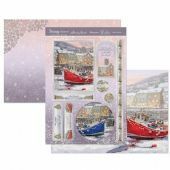 The remarkable quality of the cardstock and Topper Sheets, together with the gorgeous foiling and amazing artwork, ensures your Hunkydory Christmas cards are going to be the most stunning card your friends and family receive this year - they will take pride of place on the mantelpiece! 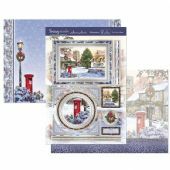 Hunkydory Die-Cut Topper Set - Let it Snow!